The raspberry lemonade Moscato Sangria gives fans a delicious lemonade-based party treat with plenty of zest. It is a simple recipe that mixes up in just a few minutes. However, just like any Sangria, it will be best if you allow it to marinate overnight. 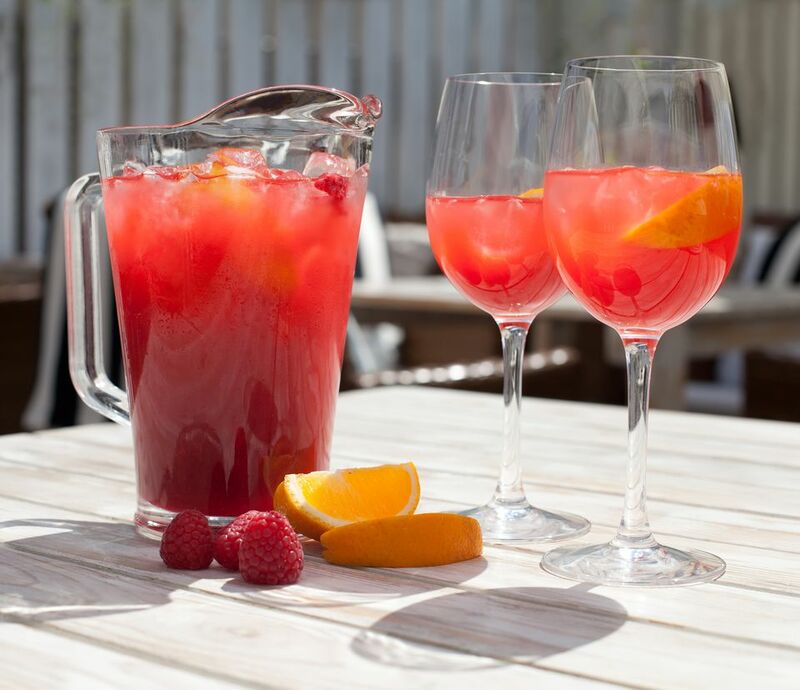 Mix the wine, berries, lemons, lemonade, and sugar in a pitcher. Feel free to use a mix of white wines or stick with a single bottle. Either way, the bright citrus flavors of lemon and the sweet berry carries a refreshing blast to the palate. It's a fabulous summertime Sangria that everyone will enjoy. Beyond the wine and raspberries, lemonade is the featured ingredient in this Sangria recipe. This means that you should pay special attention to it and the best way to do so is to make fresh-squeezed lemonade. The myth is that homemade lemonade is difficult to make, however, that is completely false. The basic lemonade recipe requires just three ingredients - water, fresh lemon juice, and simple syrup - and the ratio is a simple 2:1:1. It mixes up in a matter of minutes and your Sangria will have a cleaner, fresher taste if you take the time to make it. To get the 12 ounces of lemonade this recipe requires, mix 6-ounces distilled water with 3-ounces each lemon juice and simple syrup. Adjust it to your taste with more juice or sweetener. The lemonade should require the juice of about 3 large lemons with a little bit to spare. You're already buying lemons for the Sangria, so why not start with fresh lemonade as well? Also, you can substitute the sugar in the Sangria with simple syrup. It not only mixes easier because there's no need to dissolve it, but simple syrup is easy (and cheap) to make at home. All you need is sugar and water.